The Peoples Democratic Party (PDP) cannot afford another lengthy leadership tussle. The PDP may not be used to the role of opposition but it must master the ropes quickly and make its stand known if it intends to challenge the APC at the polls. The General election is around the corner as most Nigerian politician cannot see 2018 - all eyes are on January 1, 2019. 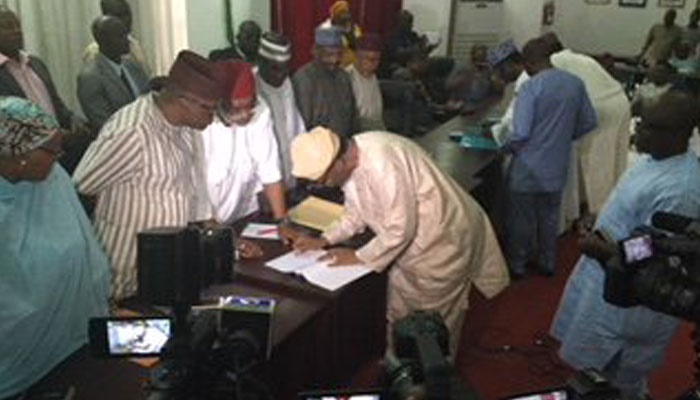 Ahead of the election of the national leader of the PDP, individuals vying for the position came together on Tuesday to sign an Accord on Prevention of Violence and Acceptance of Election Results at the National Convention. It is a pledge of their commitment towards a successful and violent free national convention on December 9, 2017. 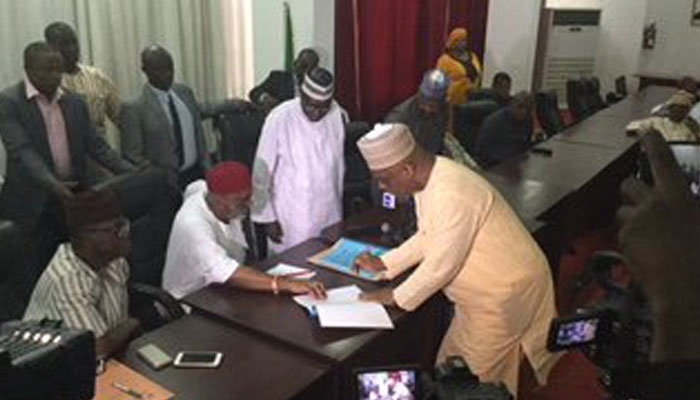 The National Chairman of the PDP's National Caretaker Committee, Senator Ahmed Makarfi, presided over the occasion held at the party’s national secretariat, Abuja. "The party is not averse to consensus, it would not impose any candidate or force any decision on anybody", he told the gathering. "Yes, we want the convention to be transparent, free and fair. "We also want the convention to be conducted in good enough time because keeping delegates for two days will be big issue. "So, it will be in order if people talk among themselves, especially where lower positions can be resolved at home by contending forces; so that those positions that are highly competitive, maybe the one that will involve elections. "Even if it is a single candidate there will be election, but you know that PDP as a family must talk to one another and try to minimise the hardship of the process,” Makarfi said. At the event, aspirants pledged to work together and support whoever wins. Speaking on behalf of the aspirants, Rasheed Ladoja, assured party members that the convention would be smooth and would not break the party or cause member to cross carpet. “We are trying as much as possible to ensure that our supporters conduct themselves in a way that they do not annoy other supporters, not to talk of other contestants. “We would try as much as possible to contrive our quota to the convention and the party in general before, during and after the convention,” he told the gathering. It will be the first leadership election that the PDP will conduct as an opposition party since Nigeria returned to democracy in 1999.